Full day today, we're back at work and the fall is one of the busiest times of the year for us, today we had all day staff planning meetings. So, my sweet mom had the kids today, and then had us for supper tonight, she went all out with roast chicken, mashed potatoes, stuffing, cabbage rolls, corn....it was absolutely delicious. She's such a good cook, and it was so nice of her. So, I'm pooped tonight from all the brain work today. But, on vacation I did take a number of images to color, and my copics, so this one was one of the many I colored. I love these amazing raspberries from the Berry Sweet set by Flourishes, but depending on the way you color them, they could be blackberries don't you think? We love blackberries too, we saw some in the Farmer's Market in the mountains on vacation that were HUGE. Today's SCS Sketch was perfect for an image like this. This is the new Concord Crush color from SU, and Old Olive, I sponged the edges of the Nestie shape with Concord Crush too, and then used two rows of the Victorian Borderabilities die for the bottom rows, feeding the silk ribbon through, and then accenting as per the sketch with this pretty crochet prima flower. The purple is even more rich and has even more depth than this photo shows. Please stop by on Friday morning, I have something extra special to share! I adore your blackberries Christine!! WOW!! And the threaded ribbon with the crocheted flower is fabulous!! What a gorgeous creation! Rich and fabulous colors/coloring. Gorgeous card, Christine! What wonderful blackberries! I just love what you did with this! The colors are so alive and vibrant! Oh my......This is just stunning! Your colors are so rich and vibrant. Your ribbon treatment is also very stunning! Oh, my! I LOVE these gorgeous rich colors!! Of course your coloring is perfect, and the border treatment and beautiful sponging around the image add the perfect finishing touches! 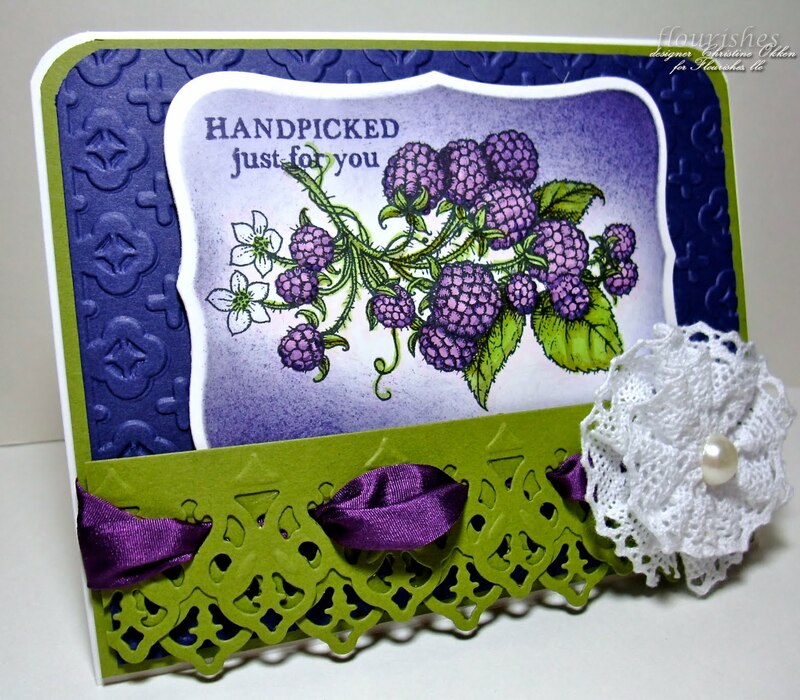 WOWZA LOVE the purple...GORGEOUS card Christine! this card is beautiful, love your border punch and that ribbon too. OOOH! This is GORGEOUS Christine! GORGEOUS layout and coloring! WOW!! Very nice! Great coloring and I love the way you threaded the silk ribbon! I bought this set but haven't inked it up yet. You've inspired me to give it a try! Beautiful coloring and sponging! 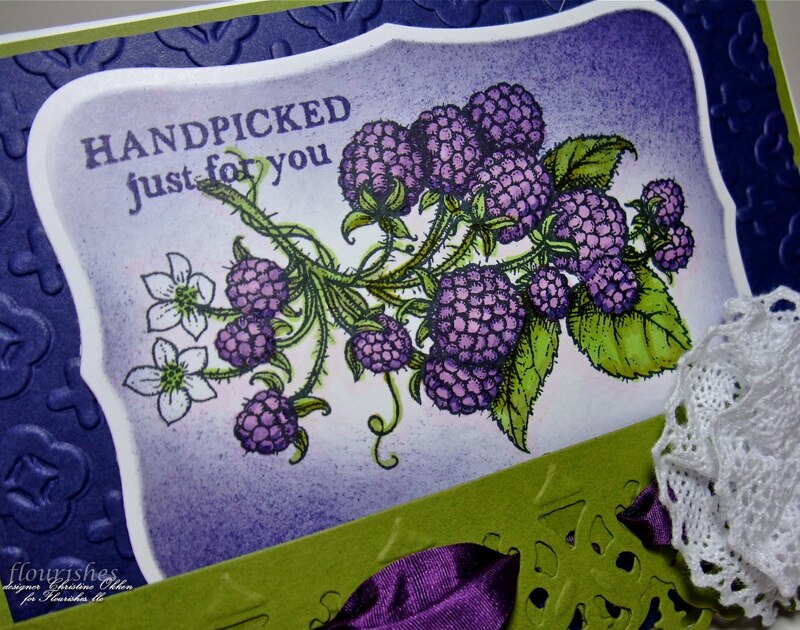 Your blackberries look gorgeous, so does the card. Your blackberries look yummy enough to eat, and your ribbon looks so wonderful the way you've woven it though your edging!! Your flower is so pretty as well!! GASP!!! Christine -- this is one drop dead gorgeous card! I love this card! When we were kids my siblings and cousins visited my grandparents every week. My grandfather grew blackberries and we would always have to beat the birds to get to eat any. This stamp, and card, reminds me of my childhood. Way more than a few years ago - lol. Christine this is fabulous! your coloring rocks and I am so glad that you are published in a book about coloring... What an honor! Gorgeous cards both of them. What beautiful blackberries! Very appropriate for this home today as we've been making apple and blackberry jam from our blackberry picking trip the other day! Gorgeous card! Christine this is lovely. The colors are wonderful together - I can't wait to do something with this color combo myself. Beautiful.